We all know at least one person in our life who is an Habitual Giver. They seem like a magnet for anyone seeking problem solving, comfort or just someone to listen to their woes. They may even cultivate this image. Meanwhile, we are usually so absorbed with our own issues that we don’t notice whether our supporter is down or feeling lonely themselves. Even when asked if they are okay, the answer is always in the affirmative. Habitual Givers always give off a vibe of being on top of everything. 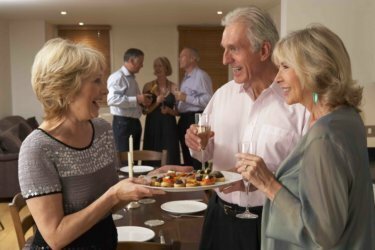 However, just like the guest at a party who would rather help in the kitchen than mingle with the guests, giving may be a way of evading something. In fact, Habitual Givers may have a problem accepting assistance. Butrelationships are much healthier when they are balanced. If you find yourself always “on call” for others while brushing off their concerns for your own well being (especially if they are valid), you can quickly find yourself becoming emotionally and physically drained. This is when giving can become unhealthy. In sessions, I will sometimes tell Habitual Givers that they are being selfish. This always gets a rise out of them, so I explain. It feels good to help others, and Habitual Givers excel at it. But they don’t receive well. So when they choose not to open up and accept help, they’re robbing their friends of the sensation they love so much themselves. If you suspect that you are addicted to giving, how do you gain equilibrium? Learning how to reach out is a good start. If you routinely brush off the concerns of others, you have essentially trained your friends not to ask. They won’t be able to read your mind and see that you’ve had a change of heart. You are going to have to take the first step and tell them what you need. So, find trustworthy, reliable friends and start asking them for help. Start with small things. Ask a friend to pick you up from the airport, to pray for you, etc. You may be amazed how willing people are to help. On the other hand, people who are habitual “takers” may not be capable of a more equal distribution of friendship. You may have to reevaluate your relationship with these people. Healthy Givers are a blessing from God. Allowing others to find this gracecan be refreshing, restorative and satisfying.If you’d like to learn more, or could use some guidance through the process, one of our counselors would be happy to help you.